The Country Music Foundation (CMF) on February 18 presented a cheque worth Rs 1 million to UNICEF Colombo from proceeds of the hugely successful COUNTRY ROADS concert. The concert, held the day before – February 17, drew a large and appreciative audience at the Hilton Colombo and was the CMF’s 25th anniversary show. The money will be used to create three child-friendly courts in Sri Lanka. 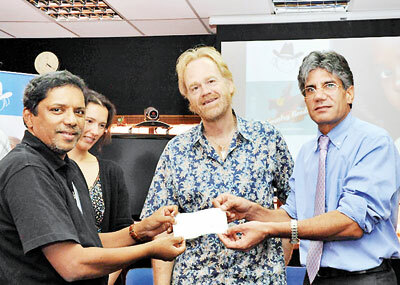 �The picture shows CMF Founder President Feizal Samath presenting the cheque to UNICEF Colombo Representative Reza Hossaini; with musicians Bob Livingston from the US and Astrid Brook from the UK also in the background.